“Early to bed and early to rise makes a man healthy, wealthy and wise.” We’ve all heard the quote, attributed most often to Benjamin Franklin, one of America’s most esteemed founding fathers. Like most memorable sayings, it’s easy to remember, and therefore easy to quote. But who among us actually takes this quote seriously? When planning for the future, do we really stop and consider how intertwined our physical and financial health actually are? Or do we just check those quarterly statements that we get from our 401K provider, shrug and say “looks good,” and then go watch our favorite TV show? If one stops to think about it, our long term physical and financial health ARE inextricably intertwined. Think of it this way: even if you save enough money, what good does it do you to have a million dollars if you’re always sick and therefore handicapped by a quality of life so poor that you can’t enjoy your money? The best solution is to plan ahead for your future physical and financial wellbeing. A strong balance of intentional discipline is necessary to achieve success in both areas. For example, a focus on healthy habits can help to defray medical expenses in the form of lowered premiums for health insurance, life insurance and long-term care in the same way that routine, proactive preventative care may negate or lessen the need for more expensive surgeries, medicine and rehab costs in one’s senior years. Sometimes referred to as “pre-hab” instead of “re-hab,” maintaining good physical health requires at least enough discipline to see your doctor once a year for a physical, to go in and get checked when your body tells you something isn’t right, to eat a balanced diet comprised mostly of whole foods, and to get regular exercise. Although they’re not always convenient to follow, these simple steps can save tens of thousands of dollars on health care expenses later in life. Obviously, no one can foresee the health challenges that are ahead for any one of us. An accident or a serious diagnosis could derail even the best laid plans, but ultimately, it’s our responsibility to invest in our own physical well-being, just as it’s our responsibility save and invest in protecting our future financial position. To the average person, making those financial choices can seem overwhelming, and it’s difficult to even know where to start. As responsible adults, we know that it’s a better choice to go to the gym for an hour than to sit on the couch and watch a rerun of Friends. We know that it’s better to order a side of soup than to choose the french fries. But when it comes to making the best financial choices, it may be time to seek out some expert advice. Krista McBeath, a Bloomington/Normal Financial Planner who specializes in financial planning, investments, taxes and insurance, can advise clients on ways to protect their hard-earned money against an unpredictable future. Krista makes recommendations to her clients only after gaining a thorough understanding of their complete financial situation, working through a series of extreme calculations and projections, then stress testing those projections until she finds a comprehensive solution that offers a high potential for success in protecting the client’s assets and maintaining their quality of life without running out of money. Chances are, your retirement dreams don’t include spending half of your life savings on health care. It’s more likely that you want to learn to draw or paint or dance. Perhaps you’d like to travel the world? Spend more time with loved ones? Play more golf? 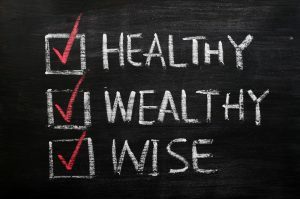 Remember the end of that Benjamin Franklin quote: “….healthy, wealthy and wise?” Health and wealth go hand in hand. After all, if you’re not fit enough to walk across a golf course, it won’t matter if you can afford to join every golf club in the world, you won’t be playing golf. If you can’t get on an airplane without hauling an oxygen tank with you, it won’t be much fun to travel, even if you can afford a plane ticket to everywhere. The “wise” part of the quote comes when you realize that accumulating wealth isn’t an accident, and neither is maintaining good health. Both require planning (“early to bed”) and discipline (“early to rise”), as well as consistent monitoring. Be sure to check your statements, eat well, exercise and check in with your doctor and your financial advisor regularly. Ask your doctor if you’re healthy enough for retirement, then ask your advisor. As soon as they both say yes, you can enjoy a retirement that’s just what you’ve always dreamed of. You’ve worked hard to make good choices and you’ve stayed in shape to make sure you can overcome the health hurdles you might expect to face as you age. You’ve saved 10-15% of your income every year and feel pretty good about the size of your retirement fund. Now it’s time to come in for a financial fitness check up to make sure that you have all your bases covered. Call McBeath Financial Group today for your free consultation, and sail into retirement with confidence. Originally published in Healthy Cells Magazine, March 2018.